Here's the spreadsheet showing the Oneida County/City of Utica Hospital Garage 60/40 Debt Split. From page 3 of documents exposed from MVEDGE's Secret Hospital Meeting. Read the full "MOA turned MOU" here City County Deal, but note the mayor has no legal ability to enforce! August 27, 2017 - We are investigating the details of a pending agreement between the county and city. The mayor and county executive have decided that taxpayers should pay for a private, non-profit, hospital to own parking garage after taxpayers pay for its construction. The documents have not been made public, so NoHospital Dwtn has FOIL'ed for them. Sadly the Oneida County Legislature went into executive session for a garage discussion, more at: County, Utica reach tentative deal on downtown parking garage. The story ends with a single line, "There is some opposition to putting the new facility in downtown Utica". However our group has created more headlines than the hospital, but Rome is home to this newspaper, the MV EDGE, the County Executive, and others - so we expect little from them. Taxpayers are the losers in the media slack reporting. Utica City Hall Says, "Taxpayers go further into debt!"... As the Mayor and Comptroller get down to the people's business, read the Palmieri-Morehouse Statement on a 30-year taxpayer debt package. Our group's reaction can be heard here, as Jim Brock and Brett Truett React to Parking Garage Agreement. The city who can't seem to fully explain the finances can be heard here, Utica Mayor Rob Palmieri and Comptroller Bill Morehouse on Parking Garage Funding. Even less understanding can be gathered listening to Oneida County Executive Anthony Picente on Parking Garage Agreement. 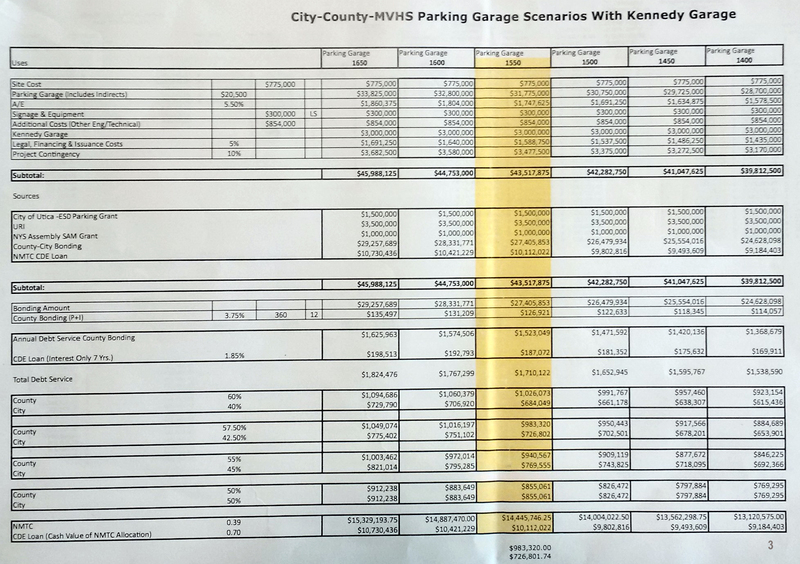 Currently Oneida County residents would fund 60% of a downtown Utica hospital parking garage. Utica taxpayers would pay 100%; 40% in city and 60% on their county taxes! Renters would see higher rents as higher taxes will place pressure on property owners. To add to the financial pain, taxpayers and residents will also pay to park in the garage they built and paid for! 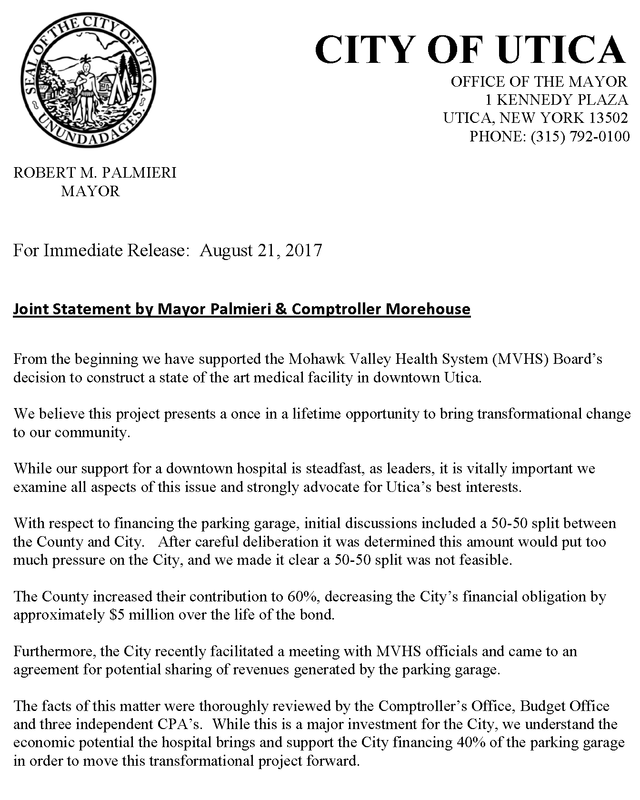 Our Utica newspaper has fallen for the missing and fake numbers, OUR VIEW: Agreement on parking garage a positive step for hospital project. However, how did the editorial staff do this without seeing the agreement(s)? August 11, 2017 - Hospital meeting: 'Illegal'? 'Inappropriate'? See a running tally of all Downtown Hospital Headlines. Read Why We Oppose The Downtown Utica Hospital Concept and consider all the advantages of the 64-acre St. Luke's Campus. Next see all the Community Voices Opposing The Downtown Concept.